President Trump spoke in El Paso, Texas, on Monday night. EL PASO, Texas (AP) — President Donald Trump charged ahead with his pledge to build a wall at the U.S.-Mexico border, skimming over the details of lawmakers’ tentative deal that would give him far less than he’s been demanding and declaring he’s ‘‘setting the stage’’ to deliver on his signature campaign promise. In the first dueling rallies of the 2020 campaign season, Trump’s ‘‘Finish the Wall’’ rally in El Paso went head-to-head Monday night against counterprogramming by Beto O'Rourke, a former Democratic congressman and potential Trump rival in 2020, who argued that walls cause more problems than they solve. Standing in a packed stadium under a giant American flag and banners saying ‘‘FINISH THE WALL,’’ Trump insisted that large portions of the project are already under construction and vowed to fulfill his 2016 campaign promise regardless of what happens in Congress. 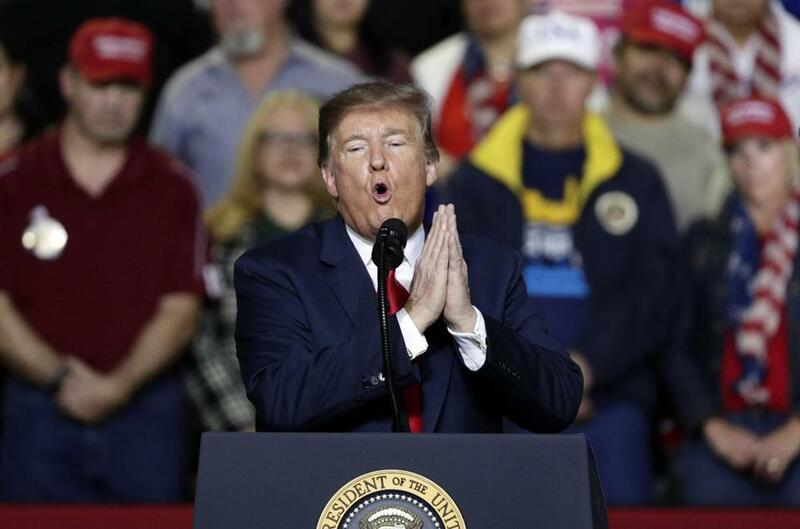 More than a half-hour in his rally, Trump had scarcely mentioned immigration, offering just a passing suggestion that those chanting ‘‘Build the Wall’’ switch to ‘‘Finish the Wall.’’ Instead, he mocked O'Rourke, insisting the Texan has ‘‘very little going for himself except he’s got a great first name’’ and deriding his crowd size, even though both men drew thousands. Many marchers, and those in the crowd at the ballpark, carried flags reading ‘‘Beto for President 2020’’ or black-and-white ‘‘Beto for Senate’’ yard signs from his closer-than-expected November race against Republican Sen. Ted Cruz that had been modified slightly to read ‘‘Beto for President.’’ The Democrat said the event wasn’t only about him — or Trump — but meant to tell the true story of life in El Paso.